Hersha Chauhan, an 8th Grader at East Ridge Middle School, was voted the first Ms President US of Ridgefield. And she immediately followed through on her campaign promise. 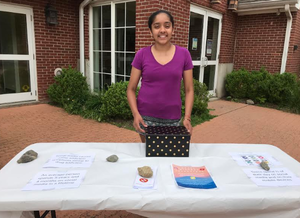 Following her election in May, Hersha held an event at the Boys and Girls Club of Ridgefield to ensure that everyone had a chance to hear her message – not just those enrolled in the Ms President US program. Hersha’s campaign topic was “Hours Without Technology” which drew attention to the perils of spending too much time in front of a screen and not enough time interacting live with friends and family. Her goal is “to raise awareness to the rising issue of social media overuse and learn about its staggering mental health effects.” All proceeds from the event were donated to the National Alliance on Mental Illness, which is dedicated to building better lives for the millions of Americans affected by mental illness. Now a freshman at Ridgefield High School, Hersha will be a Mentor for the Ms President US program and will help other girls develop their own leadership skills, including helping them prepare their campaign speech in an effort to become Ms President US of their town. Girls entering 4th to 8th Grade are welcome to enroll in Ms President US. Visit mspresidentus.org and select “Enroll” to learn more. The sessions run from October through March, with a Campaign & Election at the Ridgefield Playhouse on April 7th. Ms President US is an independent 501(c)(3) nonprofit organization. Our mission is to inspire and prepare girls to aim for the highest civic leadership positions and know they can achieve them. Contributions to Ms President US are tax-deductible.